The $20 Saint-Gaudens gold double eagle is widely considered the most beautiful coin ever issued by the United States. 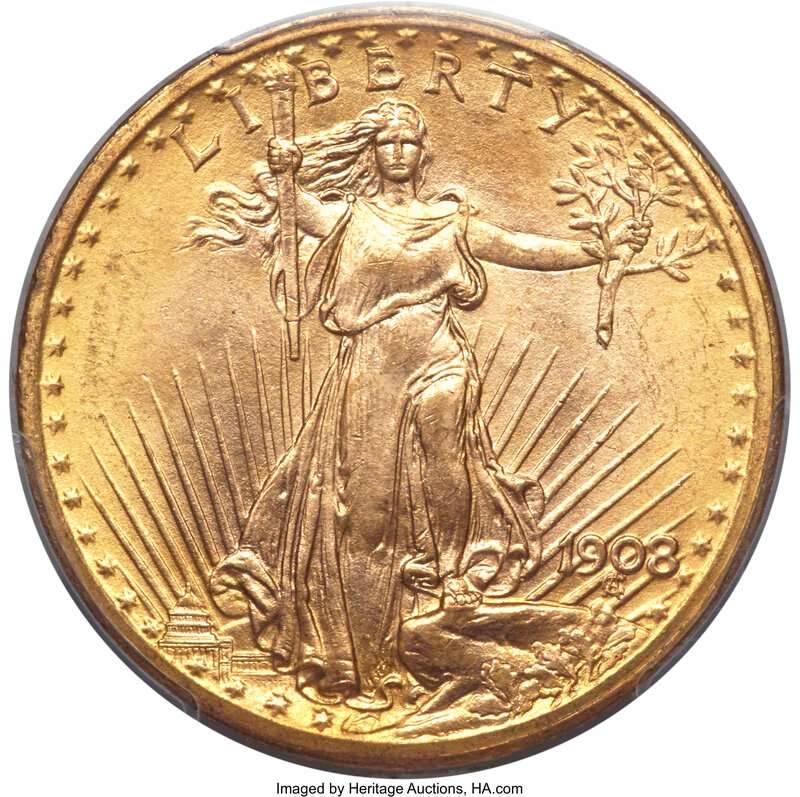 Designed by famed sculptor Augustus Saint-Gaudens, the $20 gold double eagle that carries the artist?s name represents the epitome of the so-called Renaissance of American Coinage, which generally refers to an artistic period of US coinage spanning from about 1905 through 1921. Saint-Gaudens was commissioned by President Theodore Roosevelt in 1905 to produce designs for various denominations ranging from the one-cent coin through double eagle. However, Saint-Gaudens died of colon cancer in 1907 at the age of 59 having produced final designs for only the $10 eagle and $20 double eagle. Saint-Gaudens had intended the double eagle design to be struck in high relief, and this is how some early specimens were struck in 1907. However, the high-relief design was deemed by United States Mint officials to be physically impractical to produce on a mass scale, so thus the relief was lowered late in 1907 and this motif continued throughout the duration of the series until 1933. The vast majority of Saint-Gaudens double eagle issues are relatively common and, in lower circulated grades trade for only small premiums over spot value. However, several issues are considerably rare, including all 1907 High-Relief examples, 1929, 1930-S, 1931, 1931-D, and 1932. The 1933 Saint-Gaudens double eagle is a coin in a rarity class unto itself. A sum of 445,500 pieces were struck before President Franklin Delano Roosevelt?s Executive Order 6102 in April 1933 banned the production of gold coinage. However, the government recalled all 1933 double eagles. Several individuals with examples of the coin have claimed their examples as legally obtained issues, but thus far the United States government, with the aid of court rulings in some cases, has successfully claimed all known privately held specimens save for one ? that which once belonged to King Farouk of Egypt. This specimen, famously held in a vault under the World Trade Center in New York City until just months before the complex was destroyed by terrorists on September 11, 2001, was legalized in a famous agreement with the US government. The 1933 Saint-Gaudens double eagle sold in 2002 for $7,590,020, becoming the most expensive coin ever sold. Two examples of the 1933 Saint-Gaudens double eagle are held by the Smithsonian Institution.